We visited the pumpkin patch this past Saturday. 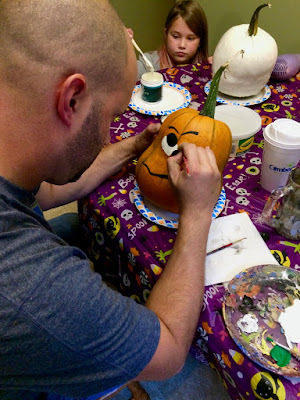 And every day, multiple times a day since then my daughter has been asking when we were going to paint our pumpkins. You see, she just loves to have fun! And, a week or so ago, I found the best idea on Pinterest for her. She loves unicorns right now and I saw the cutest little unicorn pumpkin. When I saw it she had already gone to bed, but I peeked in and saw she was awake and just had to show her. 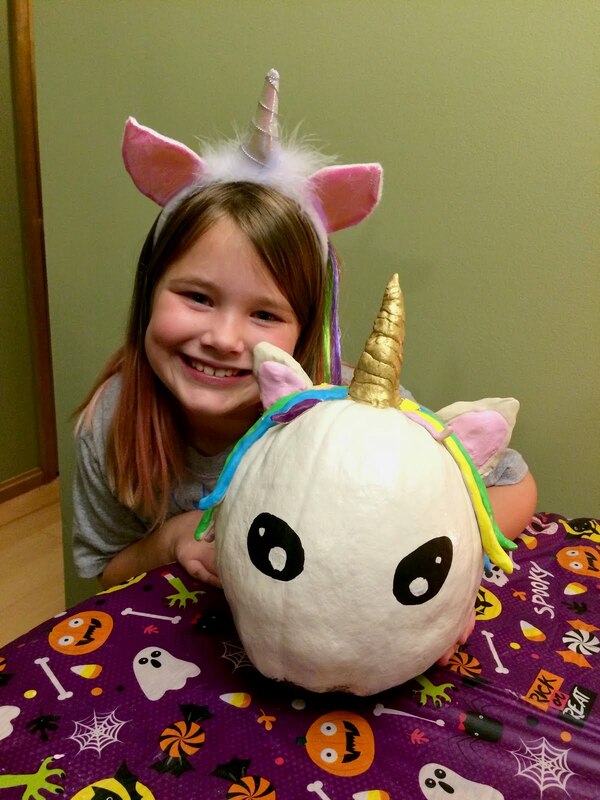 That unicorn has been on her mind for over a week now and she finally got to make it! We all had fun. I went with a simple cartoonish character, my husband found an idea for a kooky vampire on Pinterest and I think my son was inspired by Larry from Veggie Tales because that pumpkin looks awfully familiar! 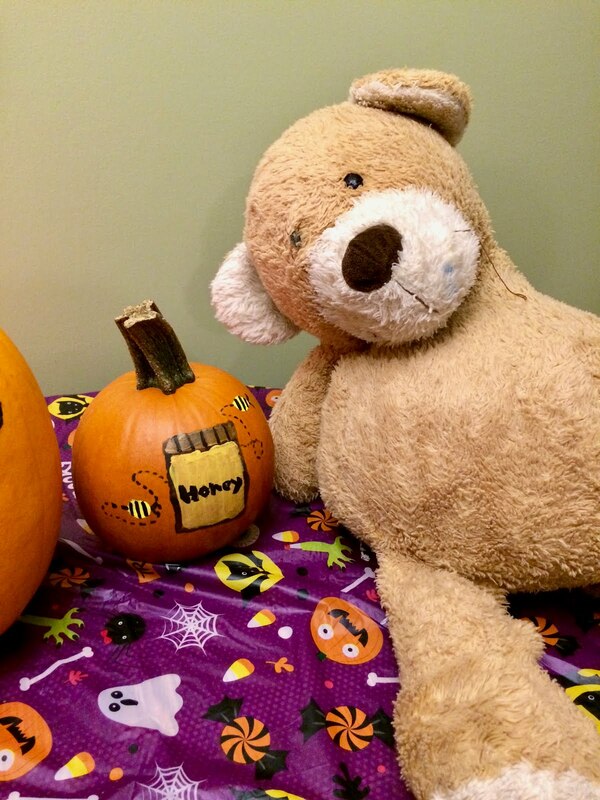 And lest we forget Teddy, the infamous bear in our house, he too participated in the festivities, painting a honey pot (apropos, right?) on his pumpkin. LOL! If you've been around us long enough, you'll know Teddy is a permanent fixture around here. I'm not sure my son will ever grow tired of him. I'm not sure I will either! So now with our pumpkins all decorated we have to figure out costumes for this coming Tuesday. My daughter's is squared away and I'm guessing you can figure out what she'll be. Let me know if you can figure it out in the comment section below! My son's costume is decided but he hasn't started working on it yet. He wants to be another Minecraft character. It's going to be Steve this time. Check out his costume from last year. If you have kids into Minecraft I know they'll love it. I think I'll coax him into starting a little sooner this year. One complication for Halloween around here is that we're trying to avoid or greatly reduce food dyes. That can be tricky with candy pouring from the sky. So I'm not going to be too neurotic. I told the kids they can have whatever they like on Halloween, then I have a plan. I bought some organic candy without food dye to switch out after the big day. I bought good stuff too. It's not healthy by any means, but I think some of us around here don't do so well with food dyes and we're trying again at an experiment we failed at in the past. I hope you found some inspiration here and Happy Halloween! Absolutely delightful! My grandchildren have outgrown the excitement and I am too far away to give it one more try with your ideas. I love how you also compromise on the candy & dye situation to teach your children early and do not deprive them of all the fun and candy pressures. You also have a delightful style writing about your family! Yes, painting is easier! I like carving for the seeds, but painting is more fun with the whole family. We have carved in the past, though. What a great family painting day! I love the designs and the teddy bear prop is super! Thanks! And Teddy is practically a family member! 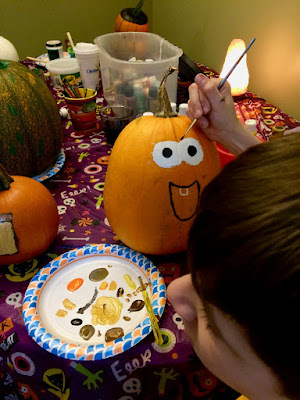 these are adorable.. my daughter loves painting and decorating pumpkins with sharpies/markers as well..
Sharpies are a great idea. And thanks!